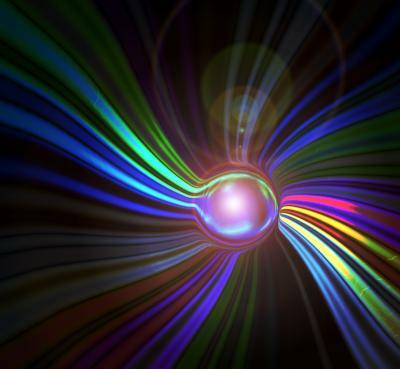 Physicists from the University of Bonn have developed a completely new source of light, a so-called Bose-Einstein condensate consisting of photons. Until recently, expert had thought this impossible. This method may potentially be suitable for designing novel light sources resembling lasers that work in the x-ray range. Among other applications, they might allow building more powerful computer chips. The scientists are reporting on their discovery in the upcoming issue of the journal Nature. By cooling Rubidium atoms deeply and concentrating a sufficient number of them in a compact space, they suddenly become indistinguishable. They behave like a single huge "super particle." Physicists call this a Bose-Einstein condensate. For "light particles," or photons, this should also work. Unfortunately, this idea faces a fundamental problem. When photons are "cooled down," they disappear. Until a few months ago, it seemed impossible to cool light while concentrating it at the same time. The Bonn physicists Jan Klärs, Julian Schmitt, Dr. Frank Vewinger, and Professor Dr. Martin Weitz have, however, succeeded in doing this – a minor sensation. When the tungsten filament of a light bulb is heated, it starts glowing – first red, then yellow, and finally bluish. Thus, each color of the light can be assigned a "formation temperature." Blue light is warmer than red light, but tungsten glows differently than iron, for example. This is why physicists calibrate color temperature based on a theoretical model object, a so-called black body. If this body were heated to a temperature of 5,500 centigrade, it would have about the same color as sunlight at noon. In other words: noon light has a temperature of 5,500 degrees Celsius or not quite 5,800 Kelvin (the Kelvin scale does not know any negative values; instead, it starts at absolute zero or -273 centigrade; consequently, Kelvin values are always 273 degrees higher than the corresponding Celsius values). When a black body is cooled down, it will at some point radiate no longer in the visible range; instead, it will only give off invisible infrared photons. At the same time, its radiation intensity will decrease. The number of photons becomes smaller as the temperature falls. This is what makes it so difficult to get the quantity of cool photons that is required for Bose-Einstein condensation to occur. The Bonn physicists then increased the quantity of photons between the mirrors by exciting the pigment solution using a laser. This allowed them to concentrate the cooled-off light particles so strongly that they condensed into a "super-photon." This photonic Bose-Einstein condensate is a completely new source of light that has characteristics resembling lasers. But compared to lasers, they have a decisive advantage, "We are currently not capable of producing lasers that generate very short-wave light – i.e. in the UV or X-ray range," explained Jan Klärs. "With a photonic Bose-Einstein condensate this should, however, be possible." This prospect should primarily please chip designers. They use laser light for etching logic circuits into their semiconductor materials. How fine these structures can be is limited by the wavelength of the light, among other factors. Long-wavelength lasers are less well suited to precision work than short-wavelength ones – it is as if you tried to sign a letter with a paintbrush. X-ray radiation has a much shorter wavelength than visible light. In principle, X-ray lasers should thus allow applying much more complex circuits on the same silicon surface. This would allow creating a new generation of high-performance chips - and consequently, more powerful computers for end users. The process could also be useful in other applications such as spectroscopy or photovoltaics.